TORONTO -- Second Cup wants to serve up a different kind of buzz by converting some of its coffee shops into cannabis dispensaries and, when legal, pot lounges. If and when regulations allow, the two companies also want to open coffee shops for cannabis consumption, said Second Cup's board chairman Michael Bregman. "(Cannabis) is going to be an awfully big business in Canada, and we have some amazing locations," he said in an interview Thursday. "I wish I knew now in what form we would be pursuing and participating. We're just trying to position ourselves so we can participate as the opportunities arise and the legislation is formed." Second Cup, once a pioneer in the world of upscale coffee, has been struggling to find its place in an increasingly competitive cafe market and has been losing market share to more dominant players, including Starbucks and Tim Hortons, as well as to increasingly popular independent craft purveyors of java. Canada's second-largest specialty coffee retailer reported adjusted net income of just $110,000 for fiscal 2017. Private operators will be able to sell marijuana, after obtaining the appropriate licenses, in provinces including British Columbia, Alberta, Saskatchewan and Manitoba. NAC is already among the organizations selected by Manitoba's government to handle retail sales of recreational pot once legal. Shoppers Drug Mart's parent company, Loblaw Companies Ltd., has applied for a license to dispense medical marijuana, and has signed supply agreements with pot producers. NAC chief executive Mark Goliger said in an interview Thursday that "the minute that that becomes a legal option, we will be first in line." While the details of those consumption lounges would depend largely on regulations, he described them as "Amsterdam, with Canadian conservativeness attached to it." "We do feel that cannabis lounges are a logical next step ... As most provinces are making it very restrictive as to where people can actually consume in public," Goliger said. Bregman said Second Cup got the idea to branch out into pot after being approached by several cannabis producers. The coffee chain "felt comfortable" with NAC as a partner, and signed a deal on Wednesday night, he added. It's unclear how many stores -- which will be under a new brand developed by NAC, according to Goliger -- will be ready by legalization, expected later this year. The companies plan to submit as many as 20 applications for licenses to the Alberta government, and see how many get approved, said Bregman. Second Cup's Bregman said the coffee chain's efforts to revamp are paying off, but it has a long way to go. 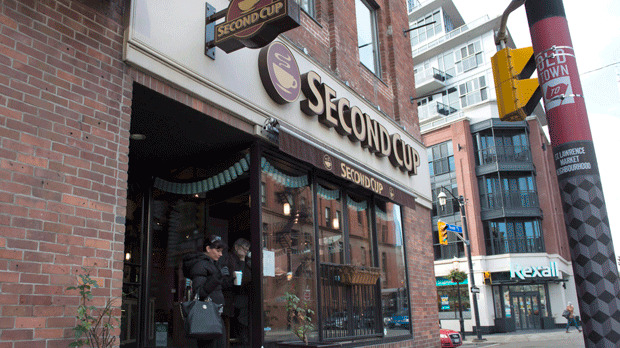 Second Cup plans to continue expanding its network of coffee shops across Canada as it develops a network of cannabis dispensaries with "compelling" economics, he added. "This is an opportunity where there is plenty of potential upside and no real downside," said Bregman. "This can't hurt the company, can't hurt the franchisees. But can help a lot if things go well."